The ALL-NEW RD series sets the new standard in the sub-gun category with it's in-field adaptability, compact design and unmatched reliability. Available in 9mm and 300BLK. Rapid Deployment - MISSION ESSENTIAL. Fully compatible with GLOCK magazines and features a flared and funneled magazine well for quick loading and reloading, especially under stressful situations. 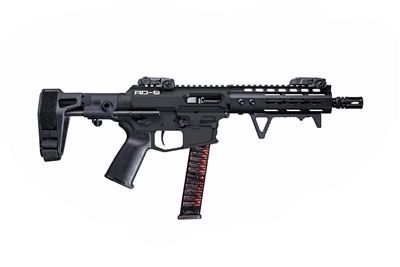 The fully adjustable Maxim Defense CQB pistol brace allows the RD-9 to be one of the most compact sub-guns on the market. 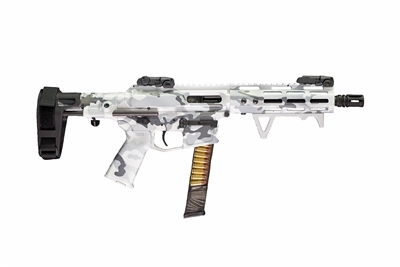 Ambidextrous safety selector, Patented side charging billet upper, WARFIGHTER DYNAMIC COMBAT Trigger, Magpul MBUIS flip up sights, Magpul +Grip, AAH handstop all come standard on the RD series. The ALL-NEW RD-45 sets the new standard in the sub-gun category with it's in-field adaptability, compact design and unmatched reliability in a .45ACP package. The ALL-NEW WOODLAND RD-9 sets the new standard in the sub-gun category with it's in-field adaptability, compact design and unmatched reliability. The ALL-NEW RD-300 sets the new standard in the sub-gun category with it's in-field adaptability, compact design and unmatched reliability and knockdown power. 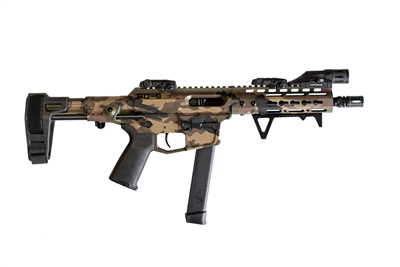 The ALL-NEW RD-556 sets the new standard in the sub-gun category with it's in-field adaptability, compact design and unmatched reliability and knockdown power. The ALL-NEW RD-300T sets the new standard in the sub-gun category with it's in-field adaptability, compact design and unmatched reliability. Features a 5" barrel matched with a SilencerCo OMEGA 9K suppressor and Midwest Industries MLOK rail.